Transportation back to Avalon will be provided!! We wanted to let you know as of today, we have donated $10,000 to the IFCR (International Foundation for CDKL5 Research) and we also have donated $22,500 to the ODC (Orphan Disease Center) at the University of Pennsylvania specifically earmarked for their CDKL5 program. 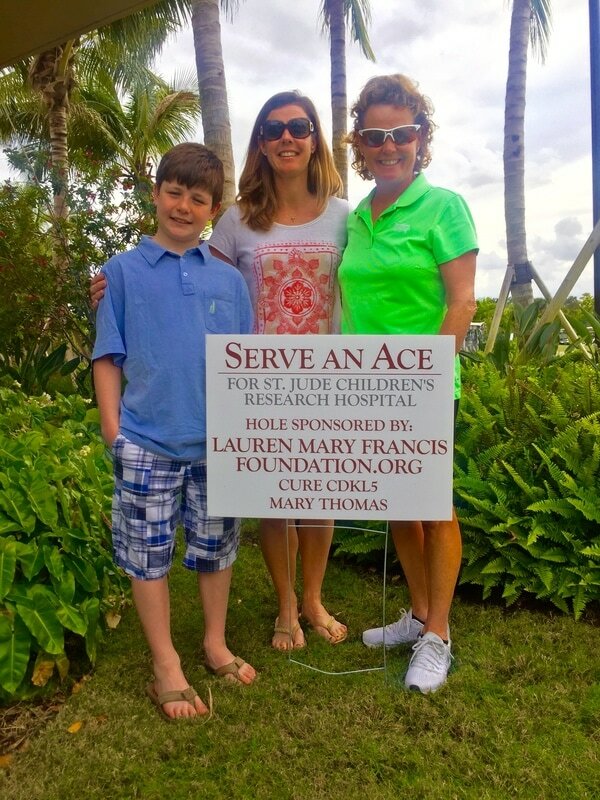 These donations will be made in memory of Francis X. Thomas III and in honor of Lauren Mary Gorelick. Thank you for your continued support. We have had a few additional donations that we are grateful for this year. Some donations were from people playing bingo for a good cause and some were thank you gifts for coaches, but most notably, many people made donations in loving memory or our Dad, Edward J. Monahan Jr. Donations totaled $10,000 and that donation will be made to the CDKL5 Program of Excellence at the Orphan Disease Center at the University of Pennsylvania. The most cutting edge scientific research and clinical program for CDKL5. The search for a cure for CDKL5 was top on Dad's list. In other CDKL5 news, our dear friend and former neighbor, Andy Plump, spoke at the CDKL5 Forum in Cambridge, MA this fall. He and his company Takeda are supporting CDKL5 efforts and are currently testing some of their drugs in mouse models. This forum is hosted by the Loulou Foundation. Below is a description of the goals of the forum. "The CDKL5 Forum is a unique community of collaboration and knowledge exchange, made up of leading scientists, clinicians and company representatives from around the world, united in the mission of better understanding the CDKL5 gene and disorder. The objective is to share current research on CDKL5 and to stimulate peer-group discussion and brainstorming around existing and future avenues of research and therapeutic approaches, in order to accelerate treatments and ultimately find cures for this neuro-genetic disorder." Please look for your 2017 tax deductible receipt for your donation in January via email. If you do not receive it please let us know. Total LMF Donations for 2017 is $42,500. Great job. We wanted to thank all of you for making the LMF weekend another huge success. We have just about hit a record breaking high of $30,000 for 2 days of fun with our family and friends. $29,742.08 to be exact. (That's $6,000 more than last year.) Please remember, if your company offers a charitable company match, LMF Foundation is likely eligible. There is some exciting news in the CDKL5 world. Robert and I have spoken to a few key members of this community and listed below are some recent press releases that were sent to us from a fellow CDKL5 parent (as well as the founder of the LouLou Foundation). 3) Amicus Therapeutics, a leading US biotech specializing in rare diseases, made the following press release announcing a new pre-clinical programme for CDKL5 including the pursuit of a protein replacement therapy: http://ir.amicusrx.com/releasedetail.cfm?ReleaseID=978421 (LLF is mentioned at the end of the press release as we were a founder investor in MiaMed). John Crowley the CEO of Amicus is a great guy and himself a rare disease parent twice over and his story was profiled in the book “The Cure” by Geeta Anand and in the 2010 movie “Extraordinary Measures” made by Harrison Ford. In your free time if you want, you can read about your genes and how they work, specifically CDKL5. 1) Next year's festivities will be July 7th and 8th, 2017! 2) Please forward this email to anyone who you think would be interested in our efforts, and send me their email if they want to be added to the distribution list going forward. 3) Many of you have asked where to purchase the horseshoes we use. I just purchased 6 new sets for next year on AmazonSmile.com supporting Lauren Mary Francis Foundation. They are called "Deluxe Outdoor Rubber Horseshoes Set" made by CSI Cannon Sports Model # 21108 (9 oz. rubber horseshoe). We had 42 teams this year, biggest ever, so you may want to start practicing now. Thanks again for all of your support. You make this charitable donation possible. The dates for the 2016 festivities are July 8th (Lauren's 13th birthday) and 9th. Hope to see you there! Well it's that time of year again, when we say thank you. Especially at this time of year, it is nice to sit back, reflect, and be grateful for all the wonderful people we have in our lives. So to all of you - THANK YOU! We once again had an extremely successful LMF weekend. We raised over $24,000 which will be equally donated to CHOP and the IFCR (International Foundation for CDKL5 Research). There are so many people to thank for all of their contributions to the weekend. We want to thank the many of you who submitted your donation for a company match donation. These extra donations are extremely generous and greatly appreciated. We also want to thank Mark Donaphon and Sun Life for donating our giveaways for the horseshoe tournament. The "Cure CDKL5" water bottles will hopefully not only be useful, but also spread awareness about CDKL5. Most importantly, this year I wanted to take a minute to say thank you for carving out a weekend in your busy lives to spend with us, to help us and to support us. Thank you for helping to teach our kids that family and friends are a priority and that we can do great things together. These lessons are invaluable. The dates for next year's festivities are July 8th (Lauren's 13th birthday) and 9th. Hope to see you there! As i sit here while the snow is coming down outside, i really wish i was on a warm avalon beach!! Seriously, at this time of year, we are reminded about the many gifts we have been given, especially the wonderful people in our lives for which we are thankful. We are thankful to all of you for making our LMF charity so successful. The 5th Annual LMF Foundation weekend raised over $22,000!!!! A huge success again and $5,000 more than last year's total. We plan to donate $11,000 to the IFCR (International Foundation of CDKL5 Research) and $11,000 to CHOP (Children's Hospital of Philadelphia). These two institutions help numerous children everyday affected with rare genetic disorders such as CDKL5. Exciting news for 2015: There is a new Natural History Study for CDKL5 which is being funded by the IFCR and one of the participating locations is CHOP. Under the direction of Dr. Eric Marsh, the study will begin in early 2015, and Lauren is scheduled to participate and see Dr. Marsh in February. This study coupled with the opening of a third CDKL5 Center of Excellence is proof that our generous donations are being put to good use. These efforts will hopefully bring us closer to a cure and better treatment for all the children affected with rare diseases such as CDKL5 and Rett Syndrome. Happy Thanksgiving! We are grateful for our many blessings!! Earlier in the year, we also had some additional contributions made to the LMF Foundation. The first was from many of our friends in Westfield who donated over $2,500 to LMF in honor of Robert's 40th birthday. The second was from our brother Ed, who raised close to $4,000 dollars while participating in the "Escape from the Cape" Triathlon. With this growing support for the 2013 year, we intend to donate $12,000 to the International Foundation of CDKL5 Research (IFCR) and $12,000 to Children's Hospital in Philadelphia (CHOP). One quick example of how your generous donations are being put to work: This fall the IFCR is opening their 2nd Center of Excellence at the Boston Children's Hospital. This quote is from a recent press release, "IFCR's vision in establishing these centers is to foster physician expertise in CDKL5, and thereby establish diagnostic, therapeutic and preventative standards of care. We are proud to partner with Boston Children's Hospital in order to improve the quality of life and to find a cure for our children." This and other news can be found on the CDKL5.com website. Please visit our website: laurenmaryfrancisfoundation.org for current news or if you know anyone else who would like to contribute. Contributions can be made online through palpay or with a credit card. Contributions can also be made with a check mailed to LMF Foundation at 526 Kimball Turn, Westfield, NJ 07090. 1 - All of the tax deductible receipts have been mailed. If you did not receive one, please let me know and I will be happy to send you another one. 2 - The 5th Annual FXT III Golf Tournament will be held Friday July 11th, 2014. Mark your calendars now and pray for no rain. 3 - The 5th Annual Double Ringer Horseshoe Tournament will be held Saturday July 12th, 2014. We had a full 32 team field this year. (you may want to get your teams in early for next year) In addition, we hope to continue the new kids horseshoe tournament which was held saturday morning this year with the winner of the tournament qualifying to play in the adult tournament. 4 - Please forward this email to anyone who would be interested and cc me so I can include them on future emails. Thank you again for all of your tremendous support. We (and Lauren) appreciate it more than you know!! Enjoy the rest of the summer!! We wanted to thank you again for another tremendously successful and fun event this year!!!! Together with the FXT Golf Classic and the Double Ringer Horseshoe Tournament we raised over $13,000!!!!!! It is amazing that in one weekend with a couple of friends, we can raise that much money. 100% of the money raised will be donated to the International Foundation for CDKL5 Research (IFCR) and the Children's Hospital of Philadelphia (CHOP). Please check out our website - laurenmaryfrancisfoundation.org and the cdkl5.com website for more information on our cause. We look forward to the 4th Annual on Friday July 12th and Saturday July 13th, 2013. We truly appreciate your friendship and support!!! !